LG revealed the G5 today and it marks an impressive change of direction for the company in terms of design, materials, and functionality. The new metal chassis is impressive and so is the modular hatch that supports a handful of accessories. 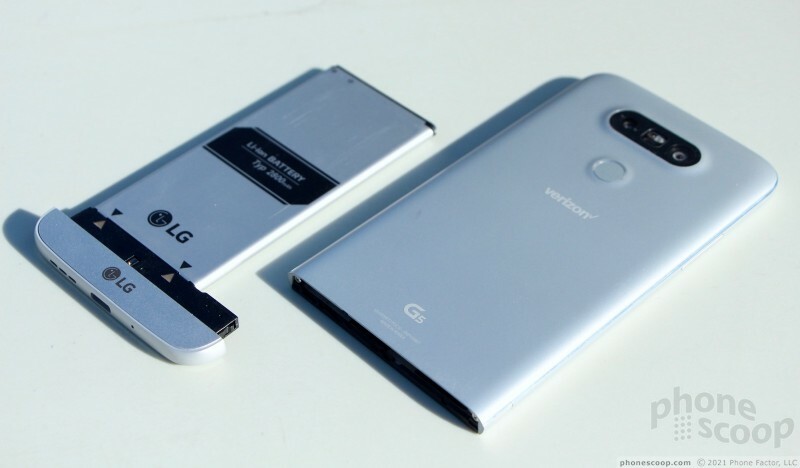 LG says it didn't want to build a me-too slab, and that's exactly what it's done. Here are Phone Scoop's first impressions of the G5. 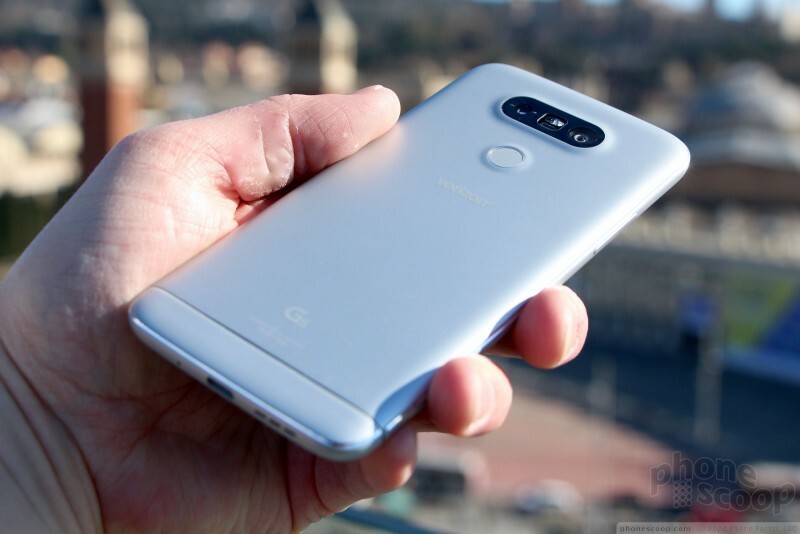 The G5 is an important step forward for LG. 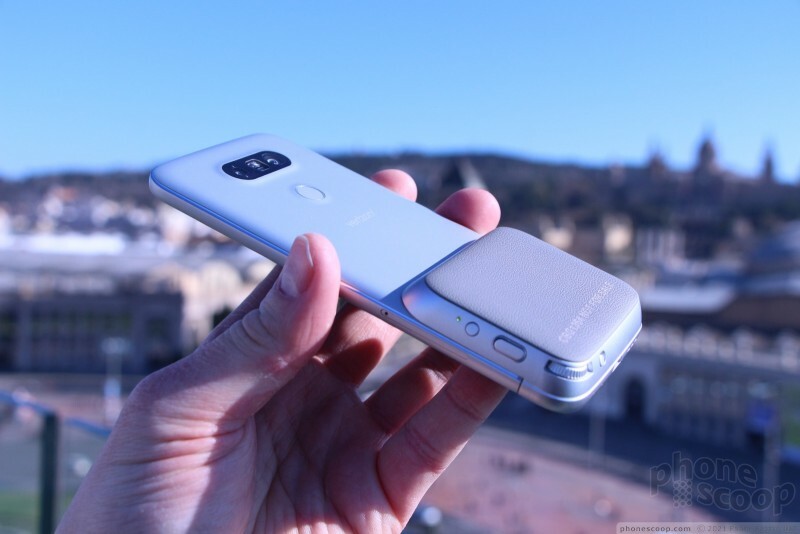 The company is clearly feeling the pressure from rivals Apple and Samsung and was sure to revamp its flagship device in order to better compete in the market for premium handsets. 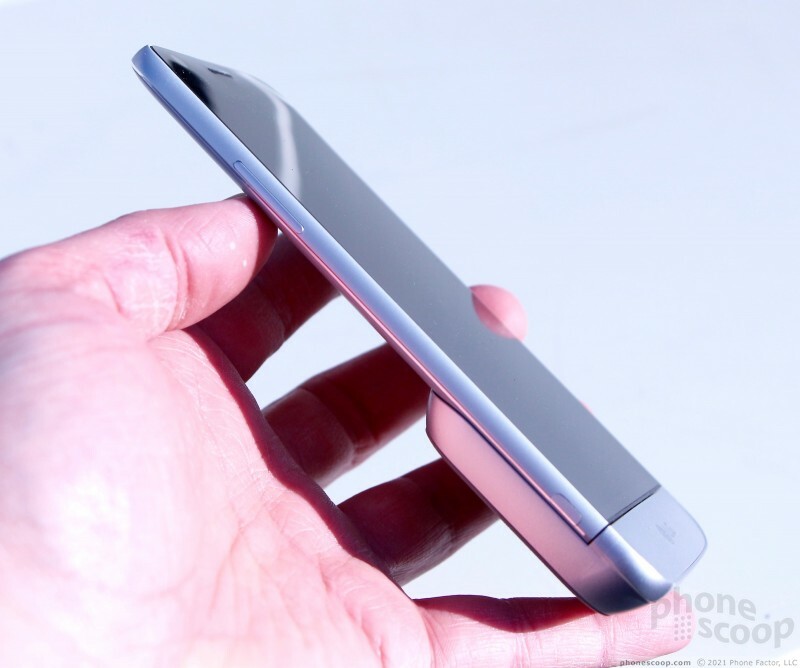 LG told us quite plainly that it didn't want to make any old metal phone, it wanted to stand out. Well, the LG G5 clearly does. 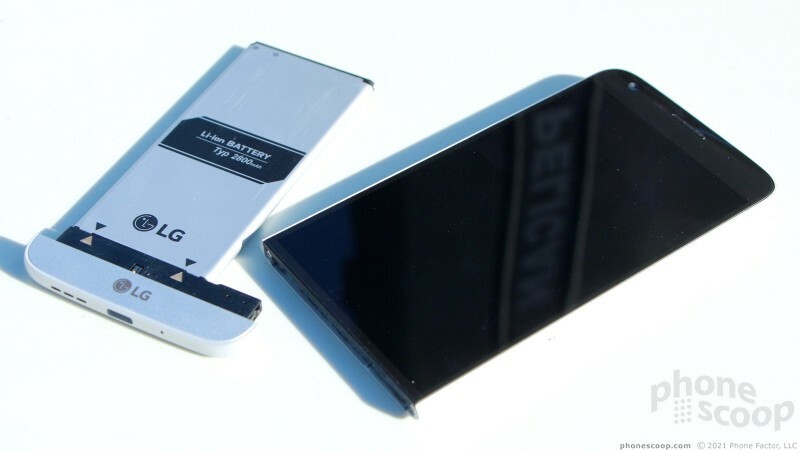 LG smartly got rid of the flimsy plastics it has used in its G series handsets in favor of an all-aluminum body. 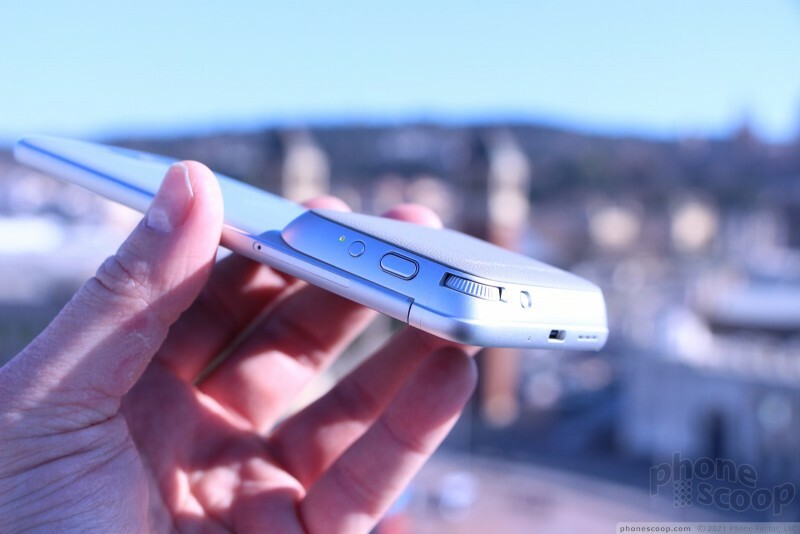 The G5 is slim, light, and finely made. 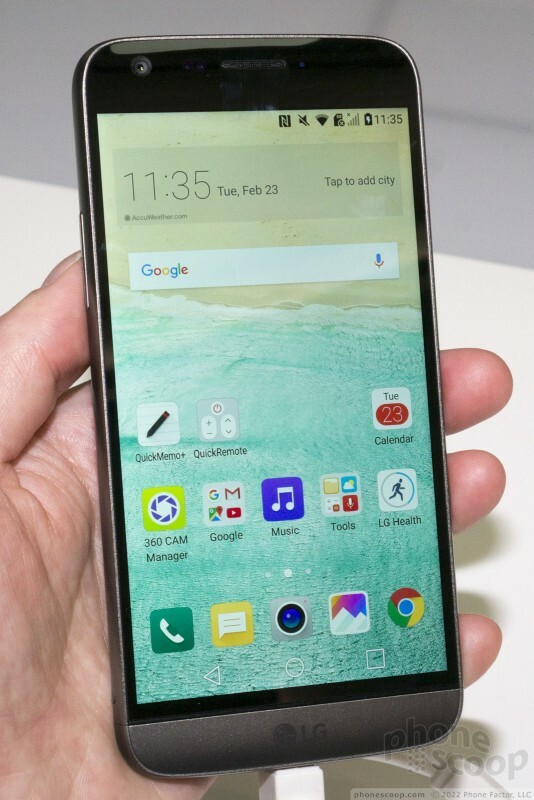 Despite the large screen, it is about the same size as the LG-made Nexus 5X. 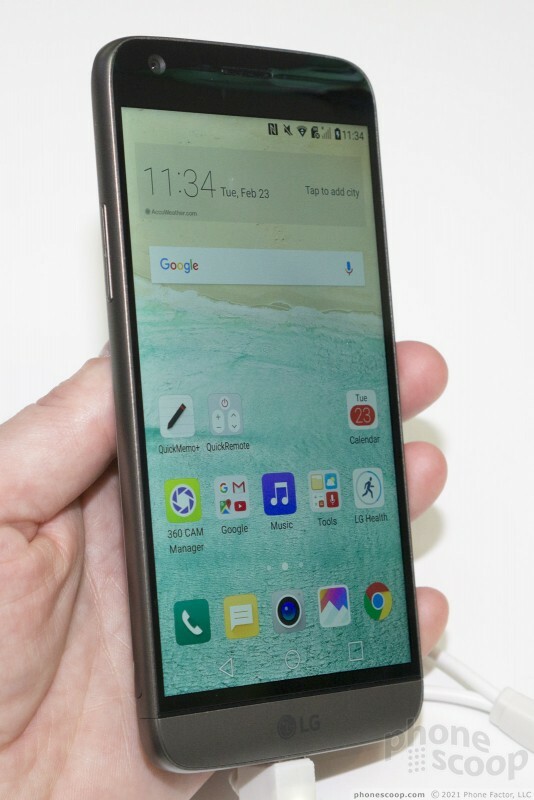 LG traded in the pointy corners and rounded out the profile of the entire phone, making it far more comfortable to hold and use. 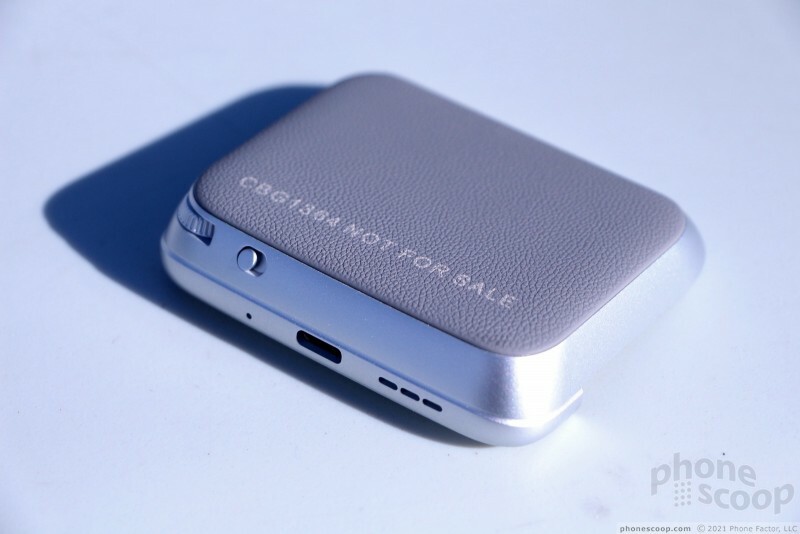 This device feels great and will be easy to carry around i your hand or pocket. 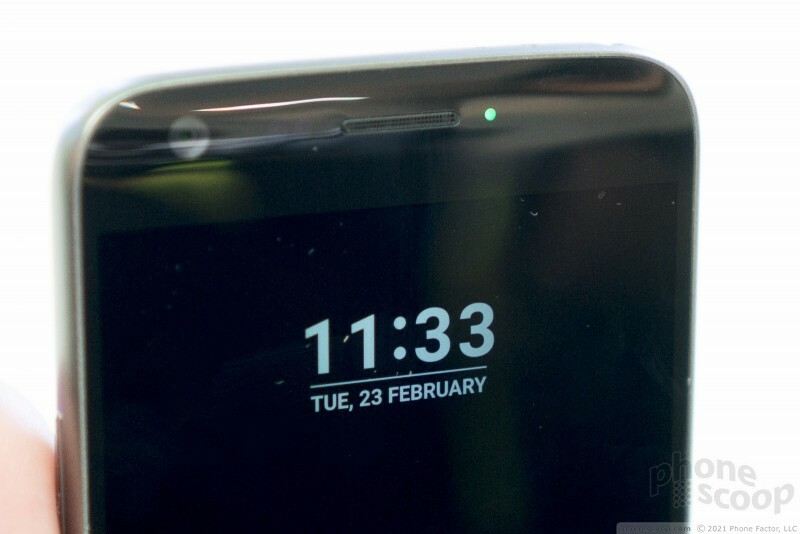 LG paid attention to details. 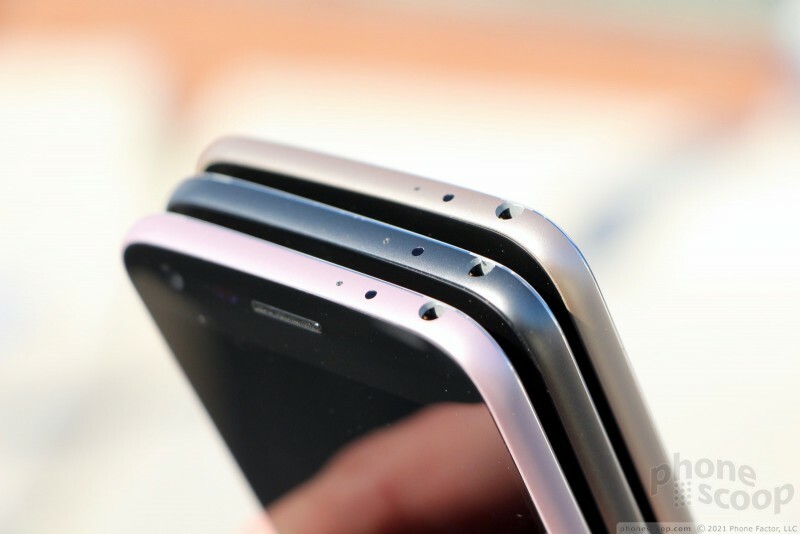 The glass protecting the screen curves just where it meets the metal frame (3D Arc Glass), and the frame itself is garnished with chamfered edges. The joint between metal and glass is seamless and tight; the materials almost flow from one to the other. 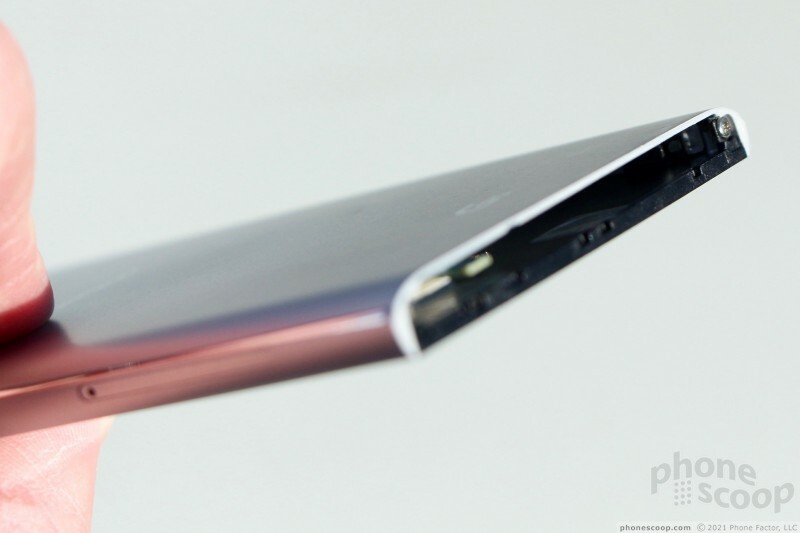 The side edges are thin and chamfered once again at the joint with the back panel. 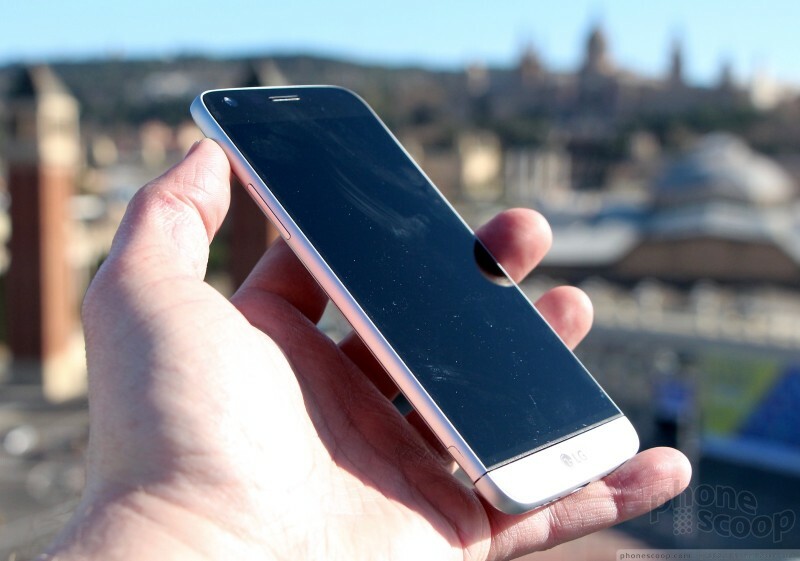 The effect gives the phone a chiseled, refined look that reminds me a bit of the HTC One M7. 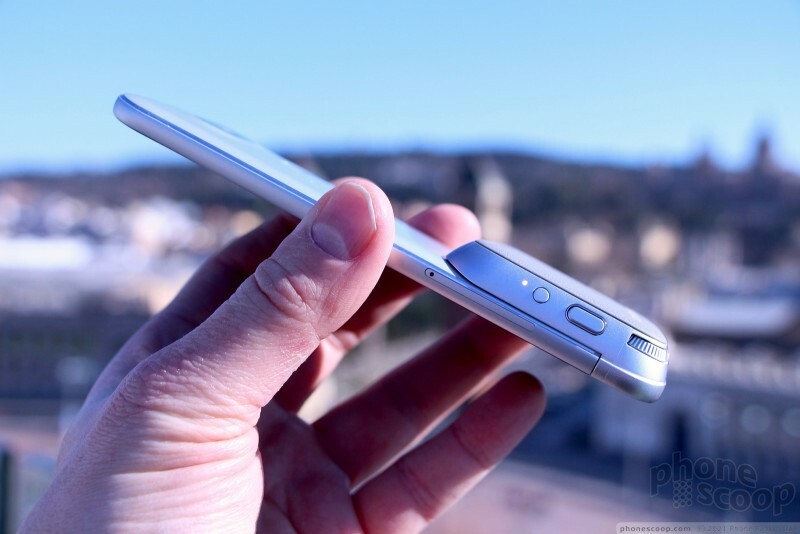 It's a handset piece of hardware. 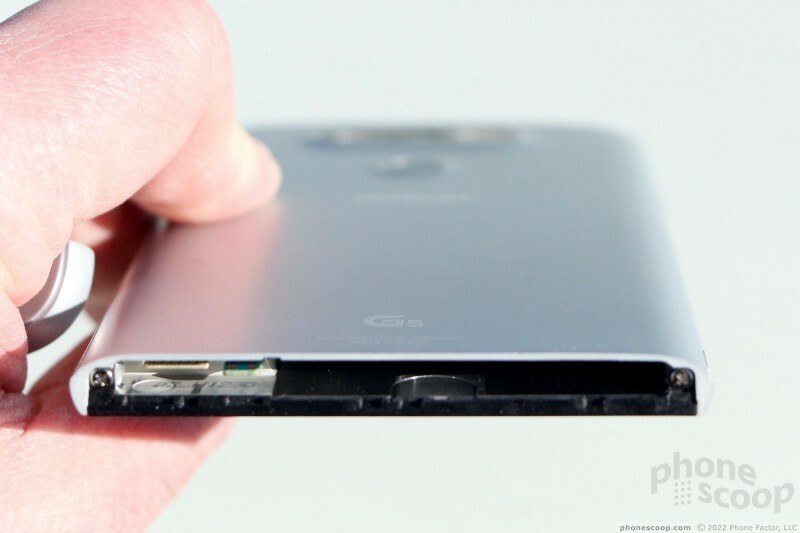 Aside from the metal chassis, LG made another significant change compared to previous G series phones: it got rid of the button cluster on the back of the phone. 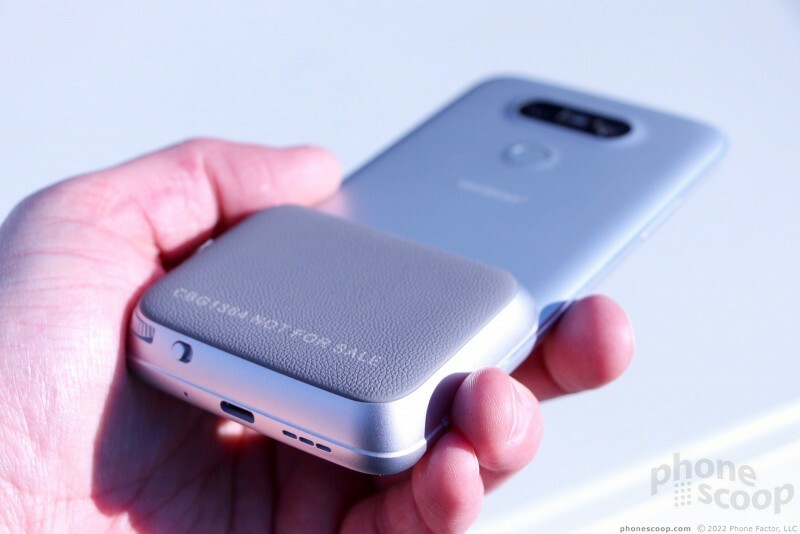 The G2, G3, G4, and various mid-range models from LG have all featured a trio of keys (volume up, power, volume down) on the rear panel. LG moved the volume keys to the side edge of the G5, citing user feedback for the reason. Apparently people weren't able to find the volume up button easily enough and complained about it. 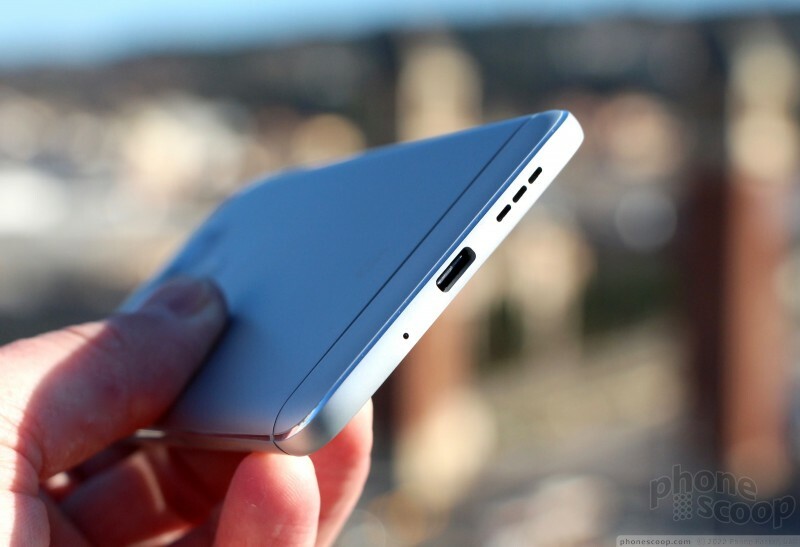 The power button — which doubles as a fingerprint sensor — remains on the back. I've used several phones that position the fingerprint sensor on the back, such as the Nexus 6P, and find it's a fine place for the sensor to be. 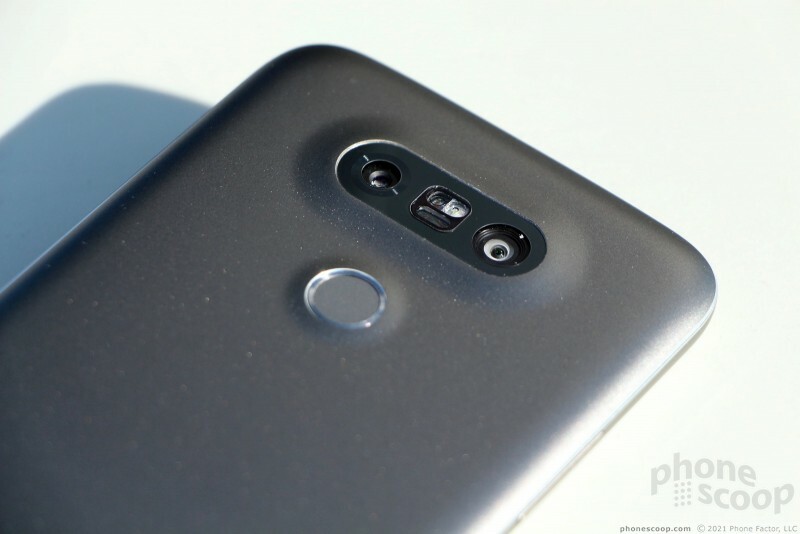 The G5's power/fingerprint button is more solid and refined than the one LG used on the LG V10, and that's a good thing. 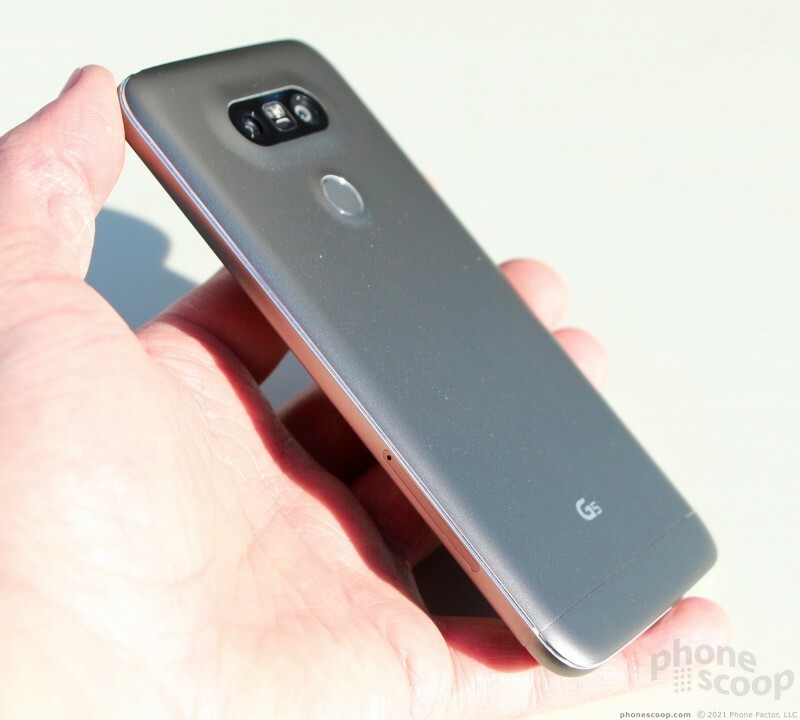 What really sets the G5 apart from competing phones is the removable bottom hatch. The phone's chin pops off entirely. 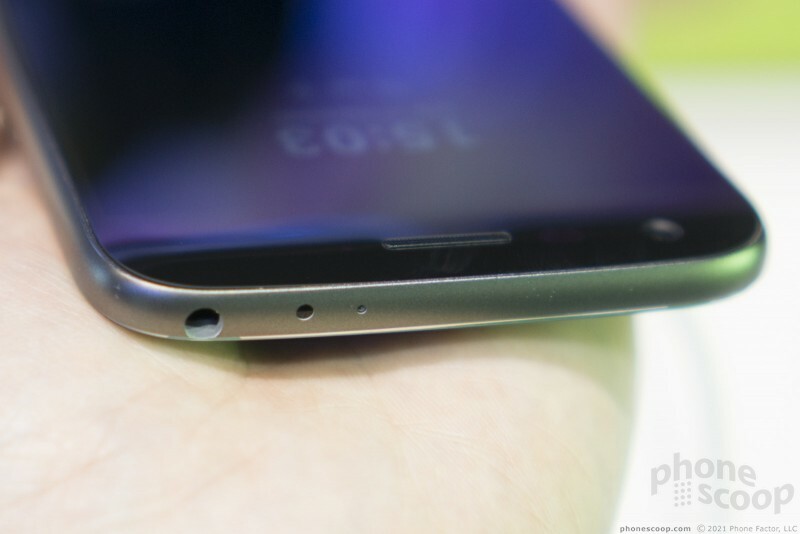 There's a little button on the side of the phone that, when pressed, allows you to remove the hatch. The primary reason for the hatch is to allow users to swap the battery. The battery itself plugs into the hatch and you cannot remove the hatch without also pulling the battery. I found the button easy enough to use. I tested the hatch on four different models. On one unit, the hatch was just a wee bit loose when connected, which had me concerned. However, the other three models had a tight connection between the hatch and chassis. The secondary function of the hatch allows the G5 to accept a handful of accessories that plug into the phone; for example, a camera grip. 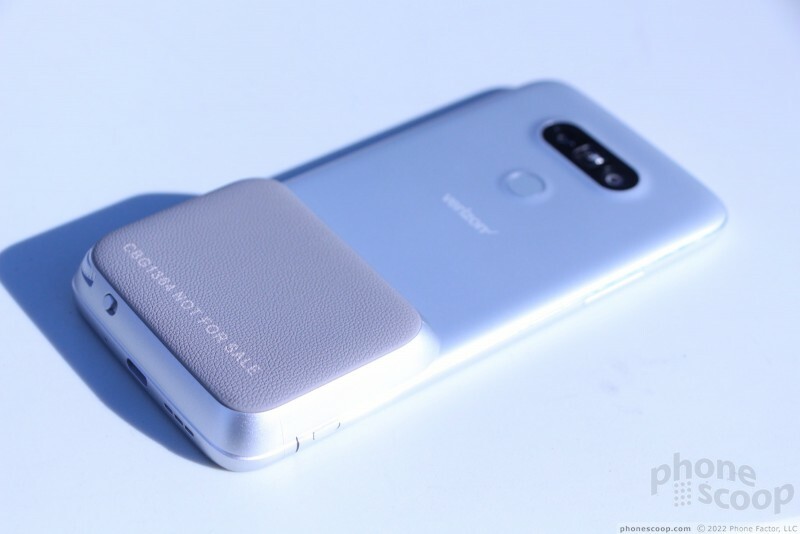 The camera grip has a extended battery (1200mAh), jog dial for zoom, dedicated shutter and video buttons, and helps you hold the phone more firmly. It isn't perfect, but it does help. It snaps into place firmly. LG has at least one other plug-in accessory for music (Band and Olufsen) that includes a battery and speakers for listening to music. 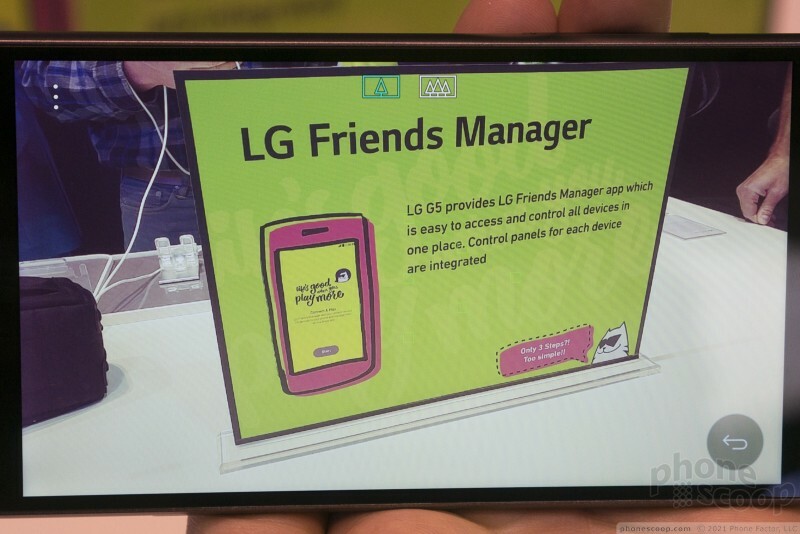 LG says these accessories are called LG Friends, and it has a whole lineup of them planned. You'll notice a dual-camera setup on the back. The G5 does not record 3D video, sorry to disappoint. 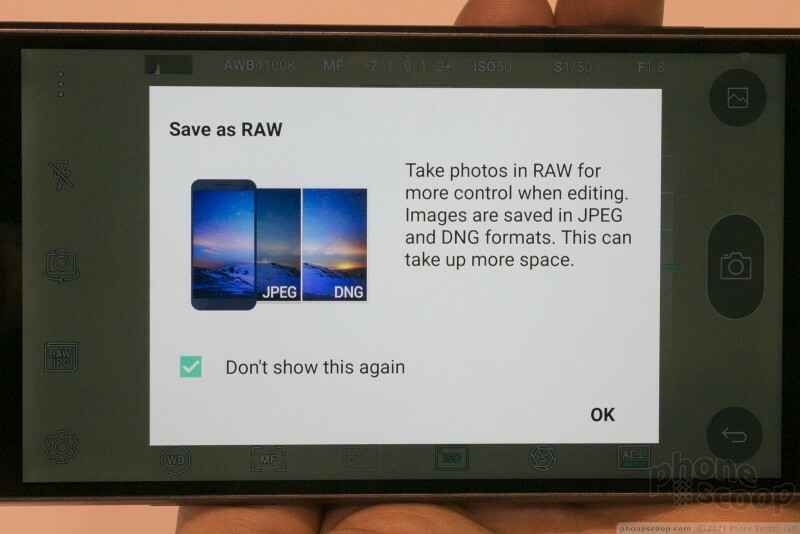 Instead, it offers you two different fields of view when snapping regular images. The main camera is a 16-megapixel job with a standard 75-degree field of view. This is great for regular photography. 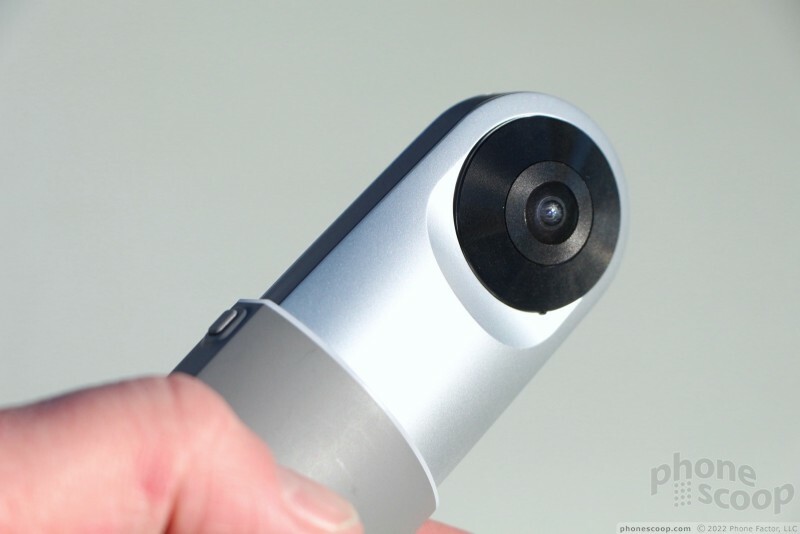 The secondary camera has an 8-megapixel sensor with a wide-angle 135-degree field of view. This is great for group shots, or making sure your subject in the foreground can fit with really big things in the background, like buildings. This is sort of a variation on the theme. 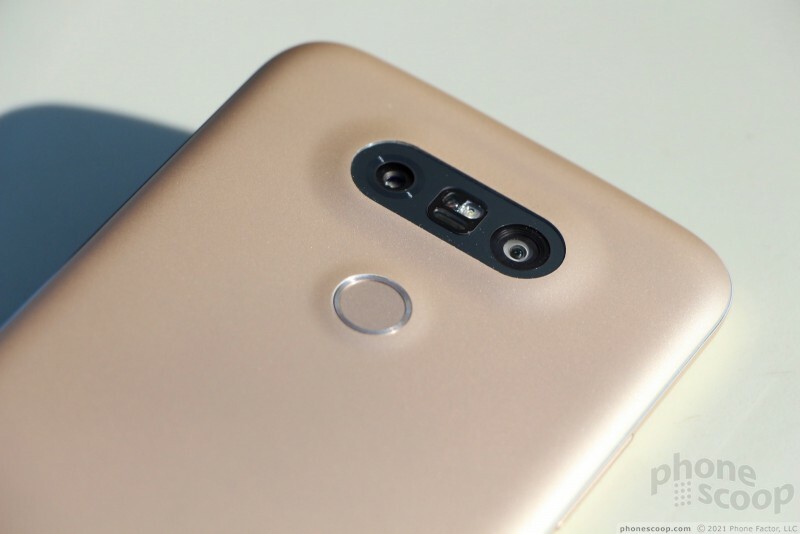 LG did something similar with the V10, though with the user-facing cameras instead of the main cameras. There's a software toggle in the camera UI to jump from standard view to wide-angle view. 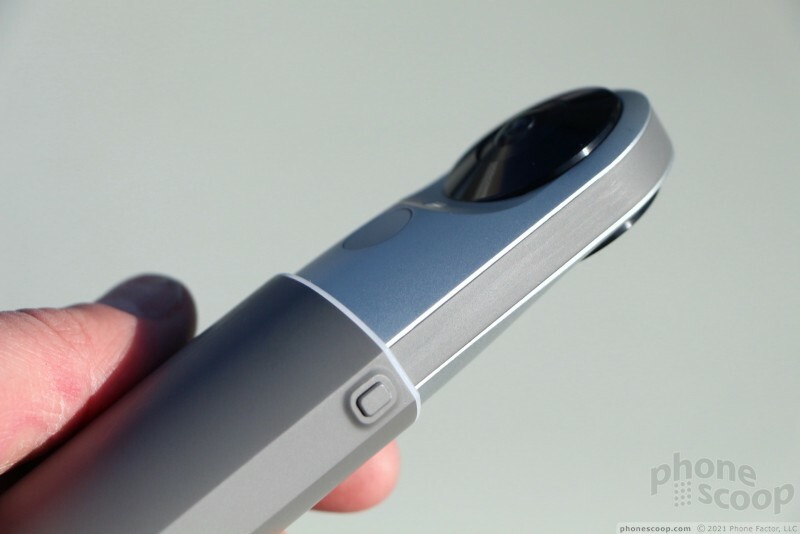 The G5 has a two-tone flash and laser-assisted focus for sharp images. 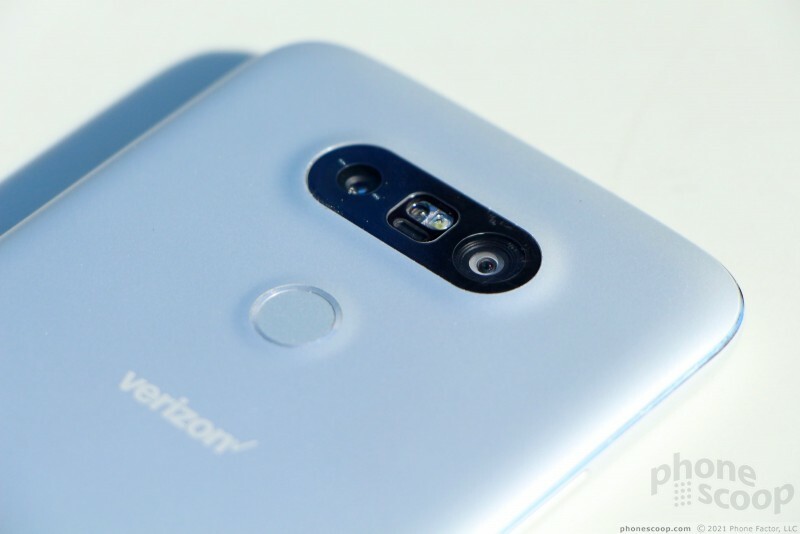 If the G5 takes images as well as the G4 and V10 do, then users will be pleased with the phone. 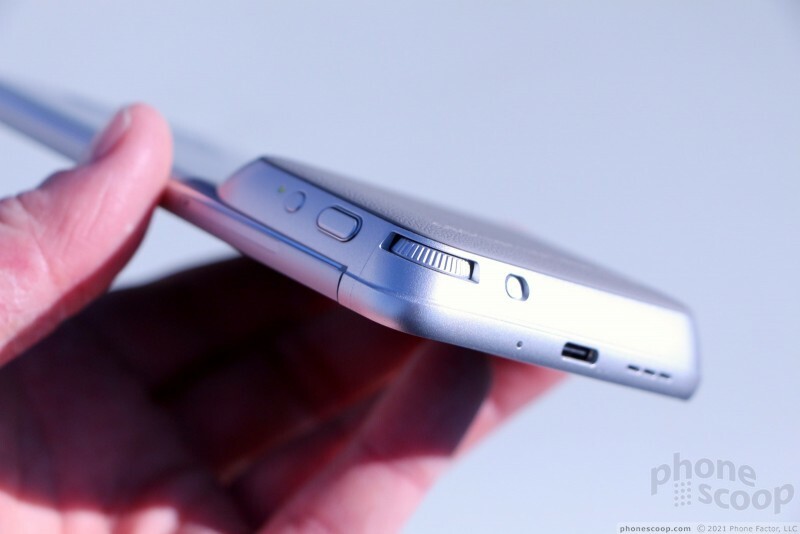 There are no buttons on the front of the phone, which is no surprise. 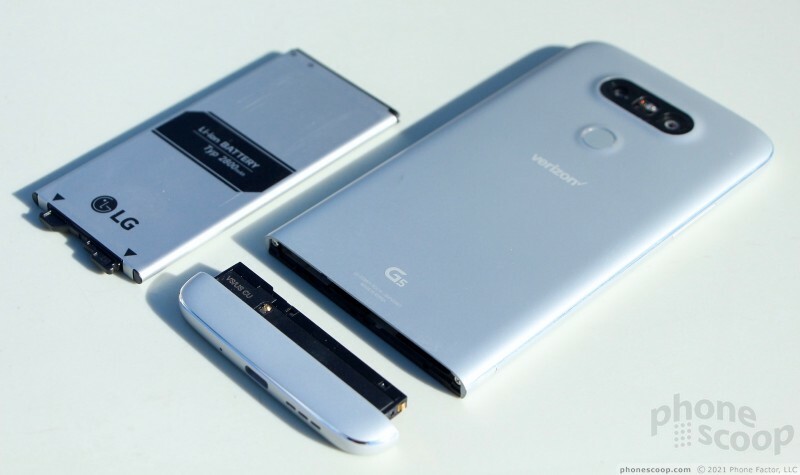 LG hasn't put buttons on the front of its G series phones for years. 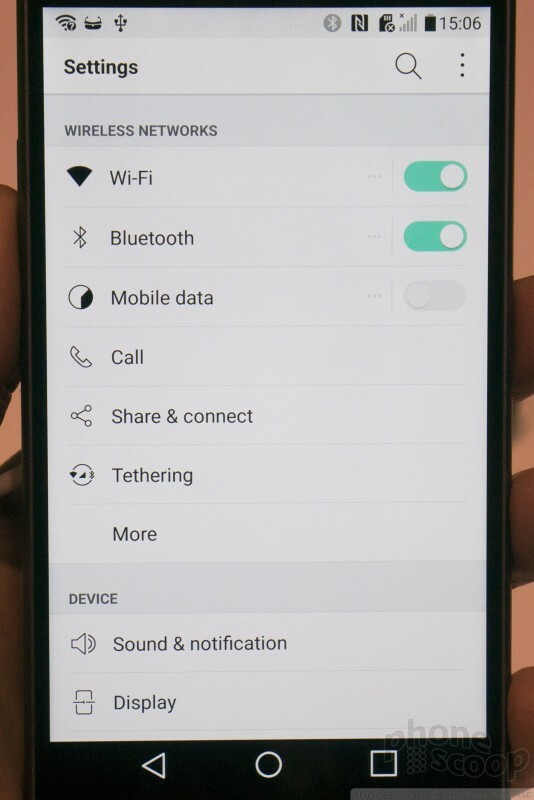 The volume toggle is on the left side of the G5. It has a great profile and excellent travel and feedback. It is easy to find and use. 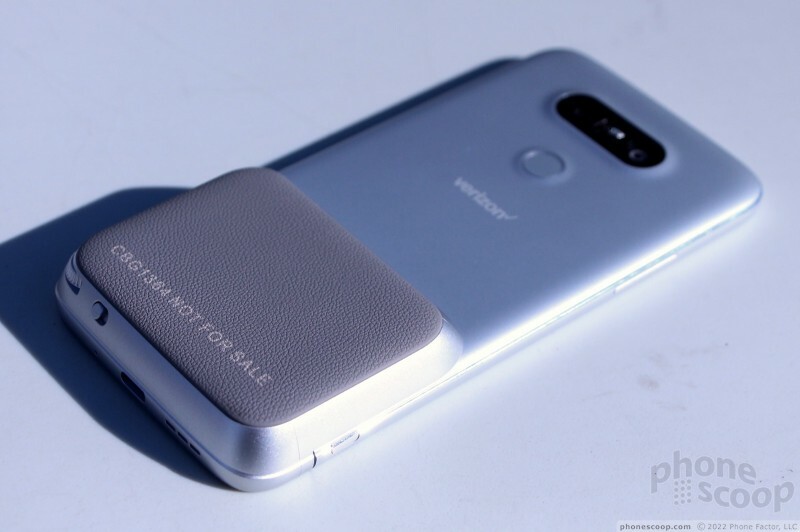 There's a tray located within the right side of the chassis that holds both a SIM card and a micro SD memory card up to 2 TB for added storage. 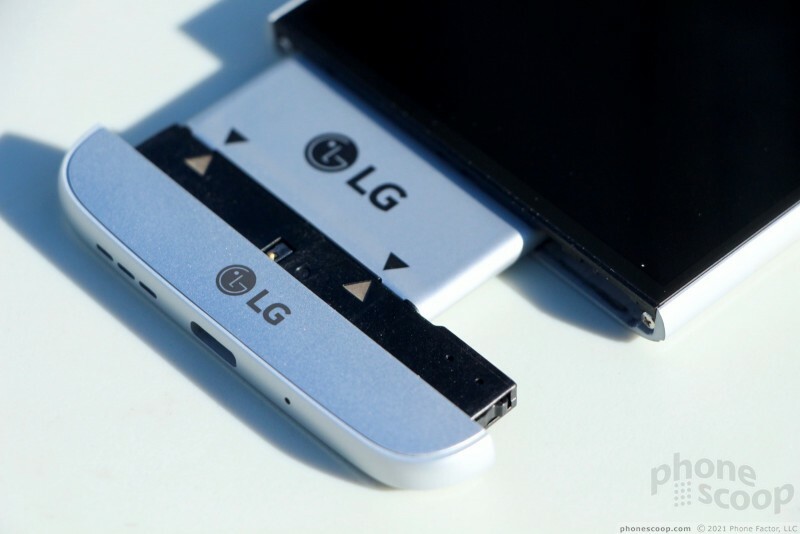 In other words, LG kept some of its main user-friendly features intact: changeable battery and changeable memory card. Well done, LG. 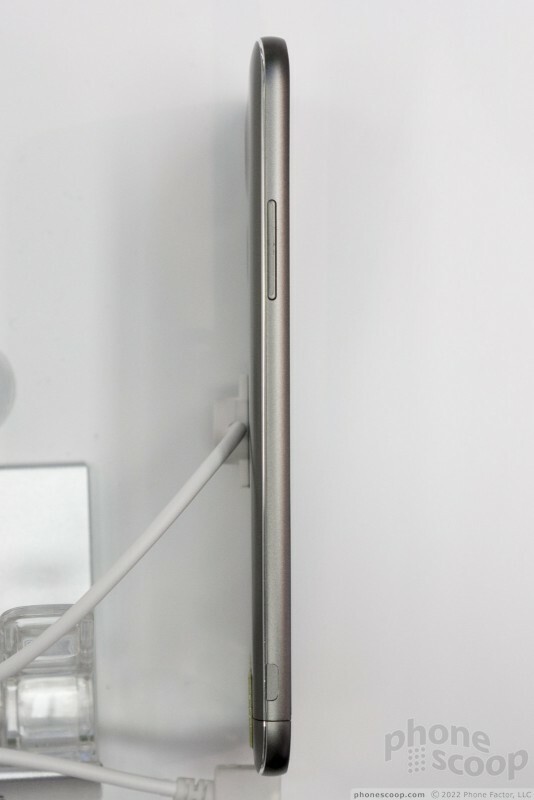 The G5 has a Type-C USB port on the bottom. 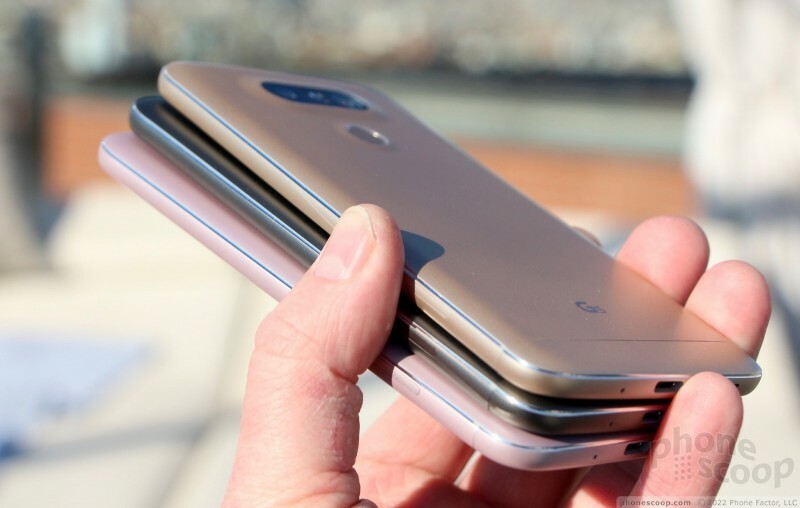 LG said it will be using Type-C on most devices moving forward. The headset jack is on top. 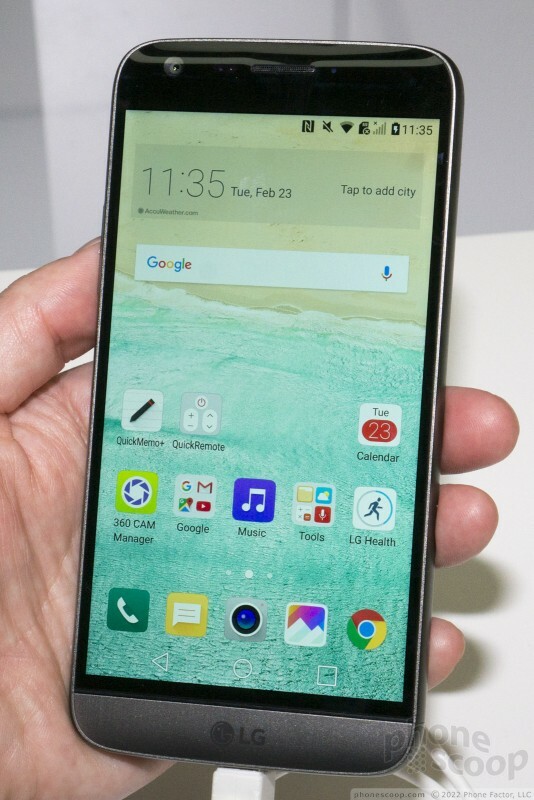 I was impressed by the 5.3-inch quad HD screen, but that's nothing new. LG makes some of the best IPS LCDs in the market and the G5's display simply dazzles. I was easily able to use it under the bright afternoon sun in Barcelona. 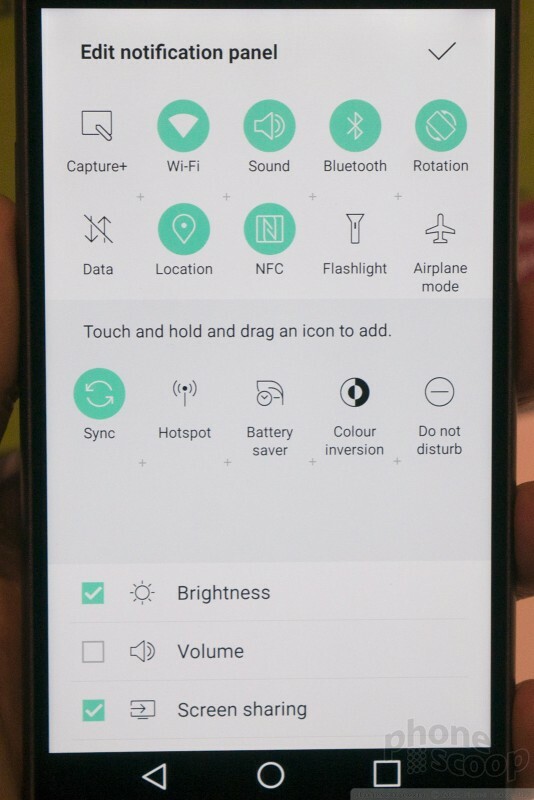 LG says it has a Daylight Mode to ensure outdoor visibility. 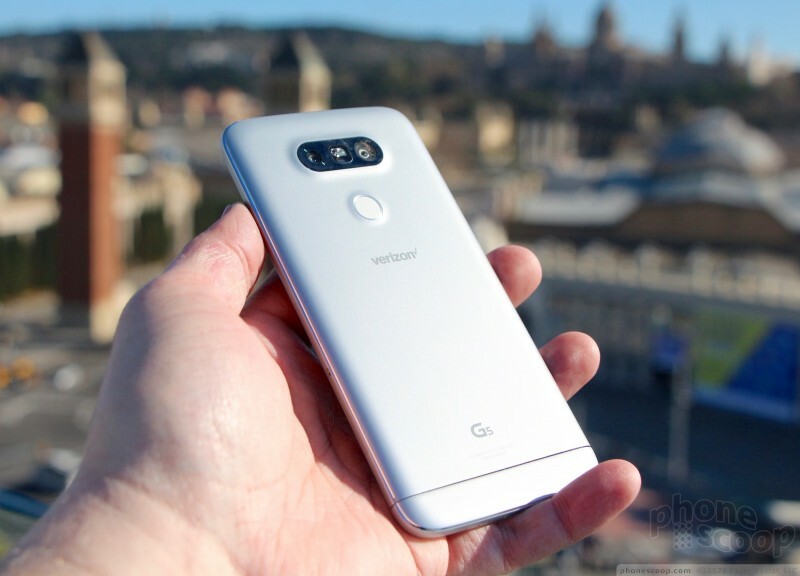 The G5 ships with Android 6.0 Marshmallow and LG's user interface skin. 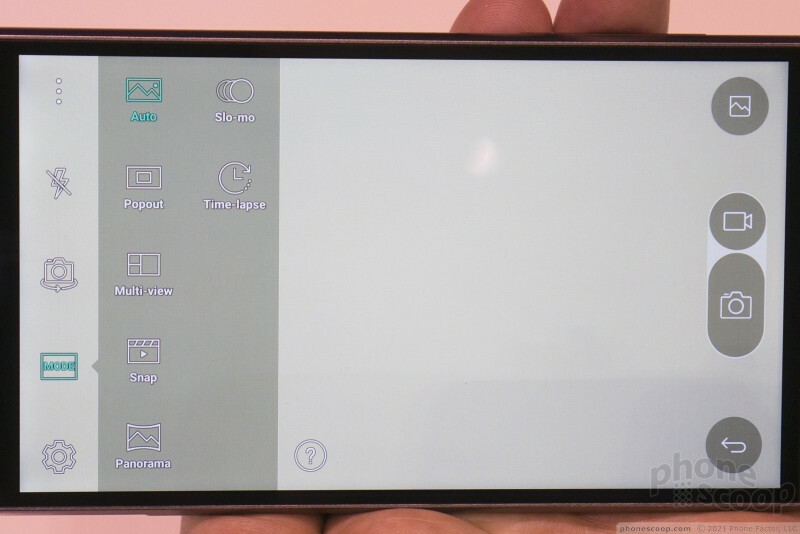 LG toned down the UI somewhat and really simplified the software that's onboard. For example, it got rid of the app drawer. Instead, all the apps are stored on the home screens. 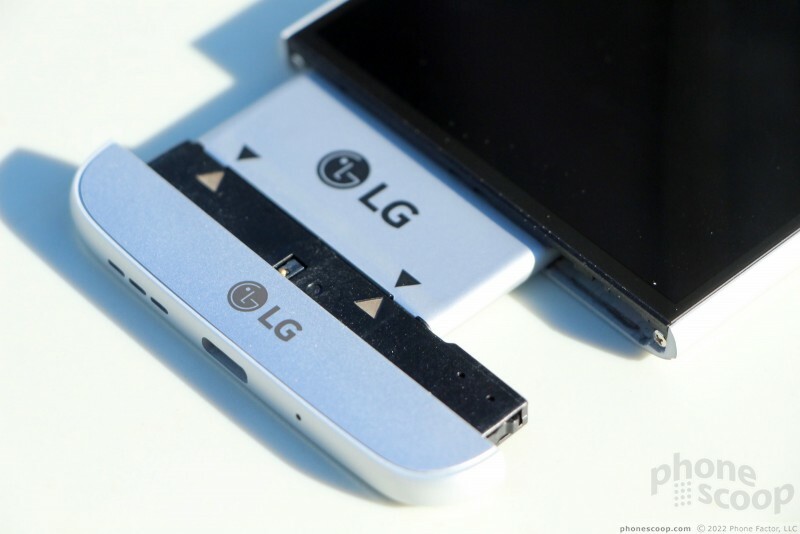 LG joins several other manufacturers in taking this interesting step. Many of LG's overbearing apps are gone, too. 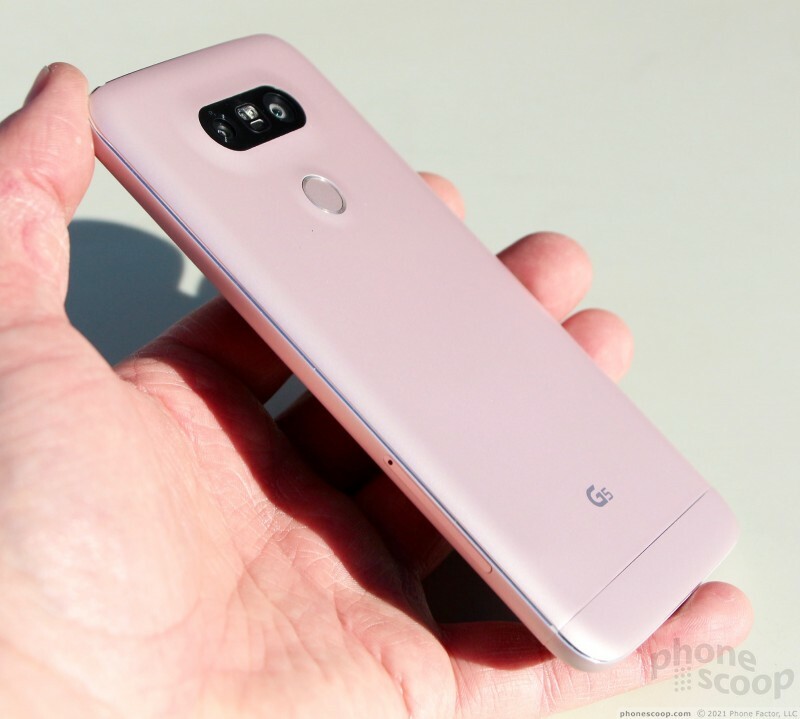 The G5 unit's I looked at were almost completely free of bloatware of any kind, and LG said we were looking at a near final build of the software. 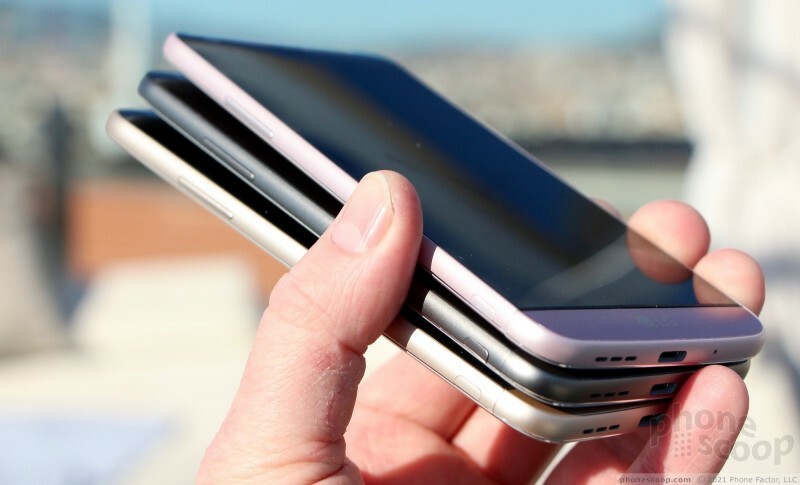 Any bloat will come from carriers, not LG. 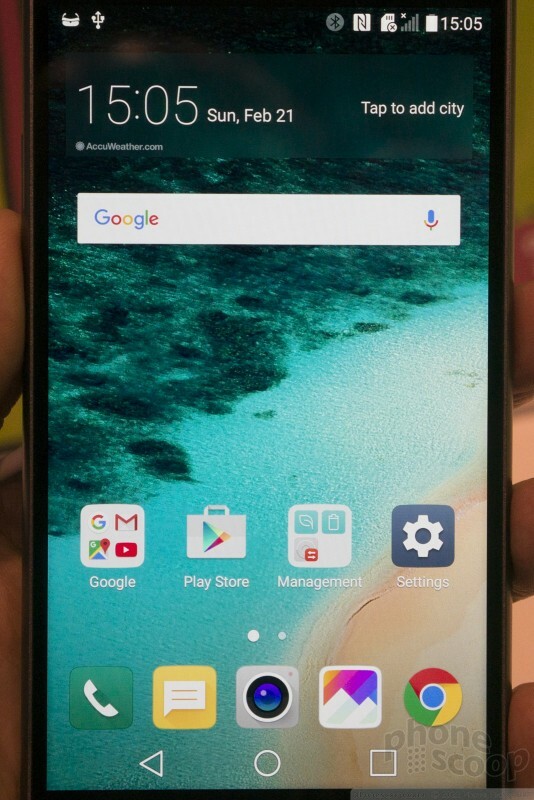 The phone is powered by a Snapdragon 820 processor with 4 GB of RAM, which means it is blisteringly fast. The 820 gives the 2,800mAh battery the ability to charge swiftly via QuickCharge 3.0 which LG says is 45% faster than QuickCharge 2.0. 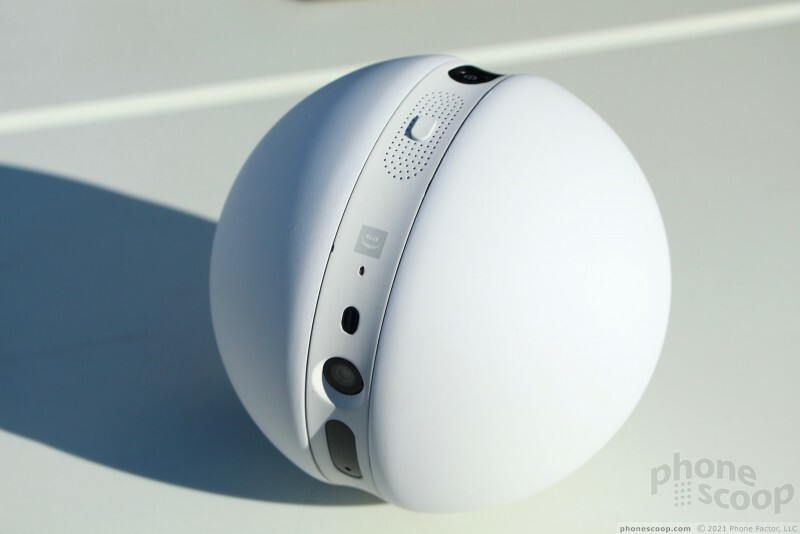 LG has other accessories in mind, too. 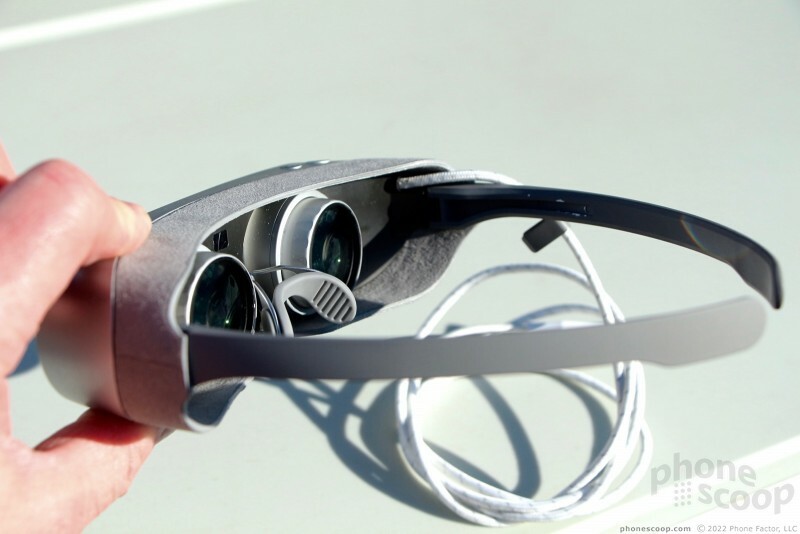 For example, the company plans to release a virtual reality headset. The headset doesn't require you to mount the phone; instead, it plugs into the phone and has dual internal displays for showing 3D video. 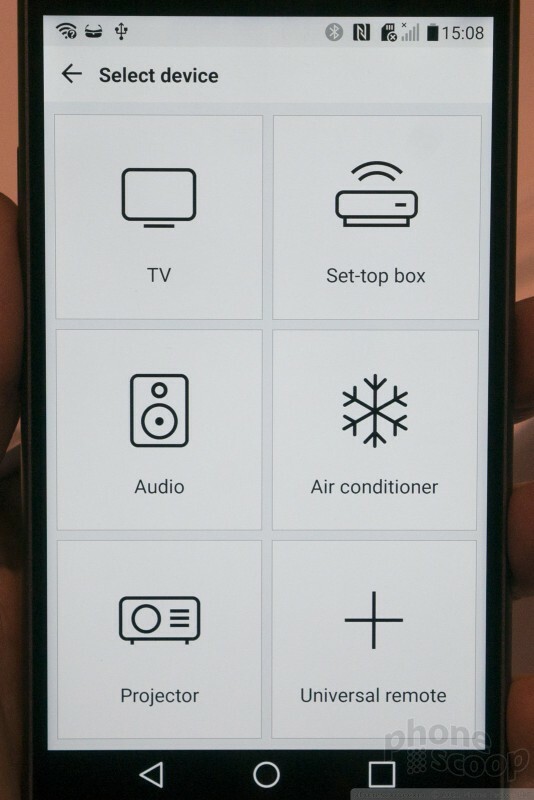 LG didn't have a working model for us to use, just a dummy unit. It looks good, but the build was obviously early stage. 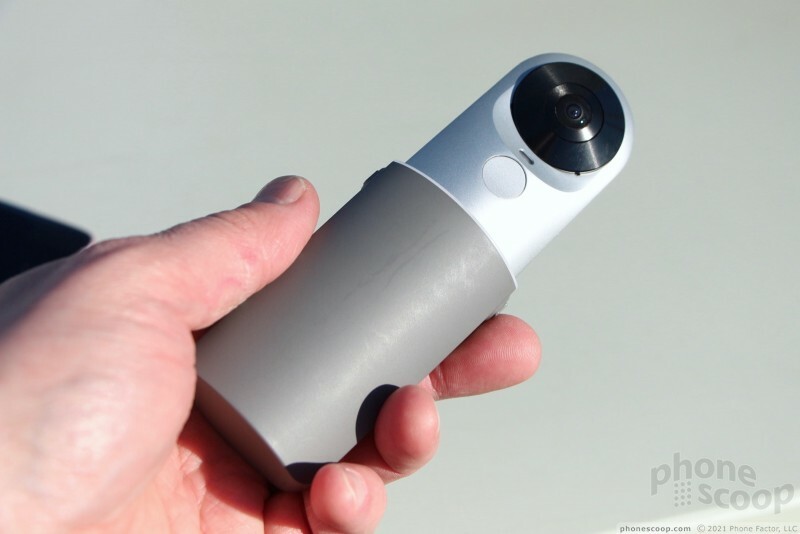 LG also has a 360-degree camera on deck. 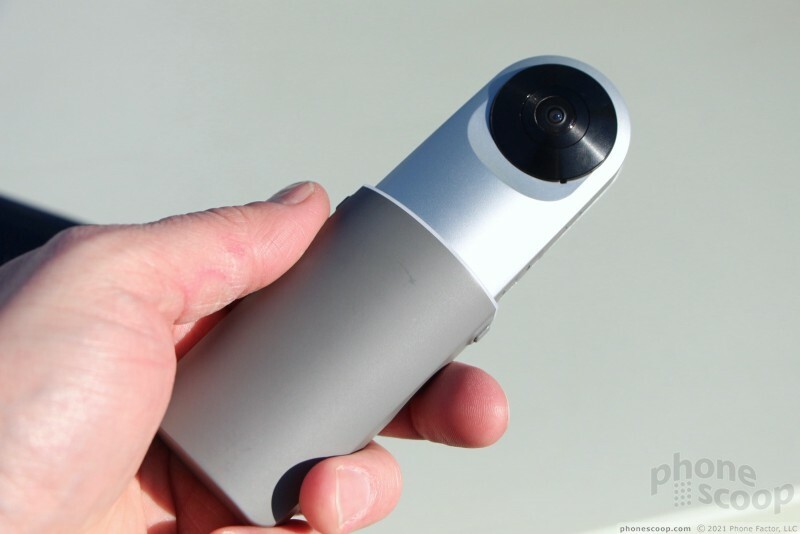 The camera can record fully 360-degree video that can be then consumed via the VR header. 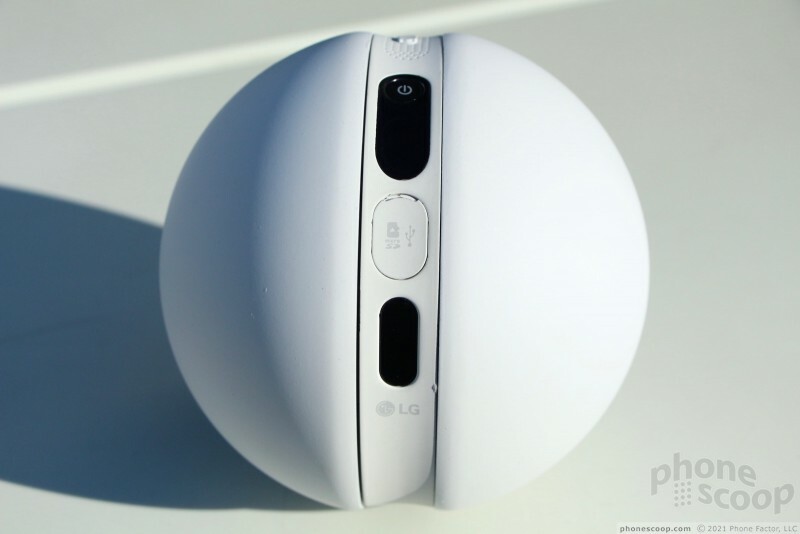 LG didn't go into depth to explain just how this will work. 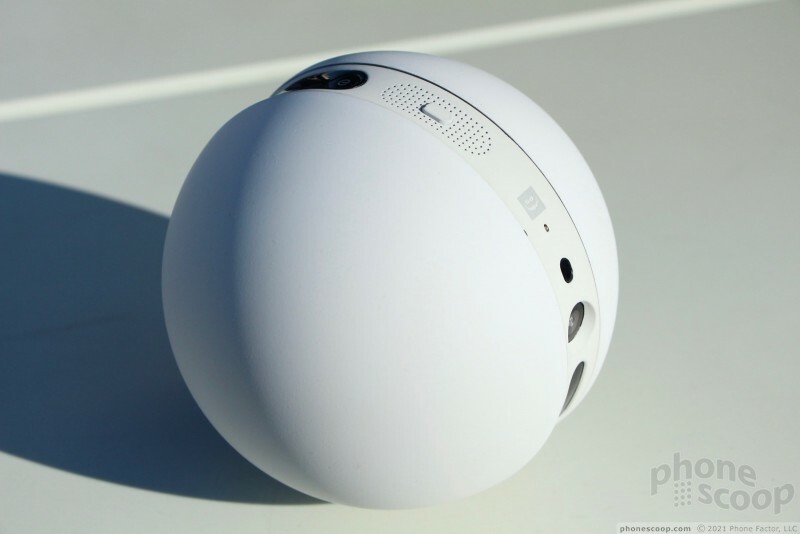 Last, LG showed us a circular robot. The robot includes WiFi, cameras, infrared, and lasers and can be used to turn your TV on/off remotely, or to annoy your dog/cat. LG said more information about these accessories will be shard later. 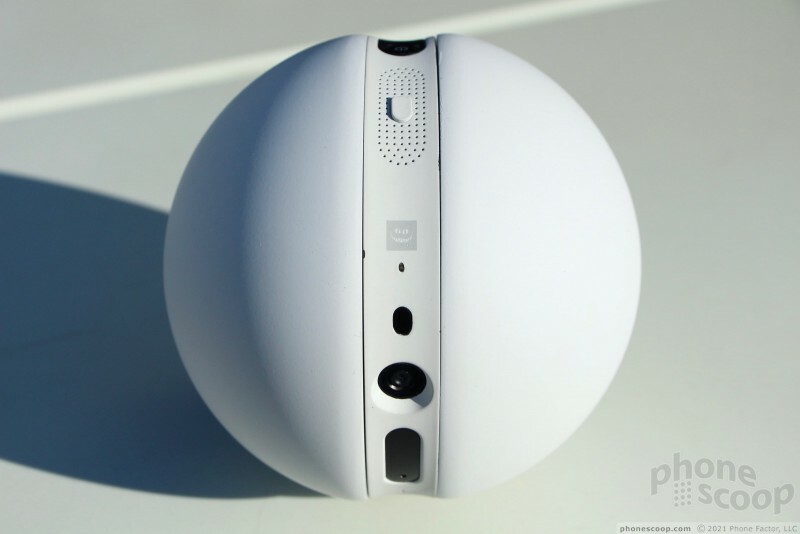 I'm going say quite clearly that I am really impressed with what LG has done. 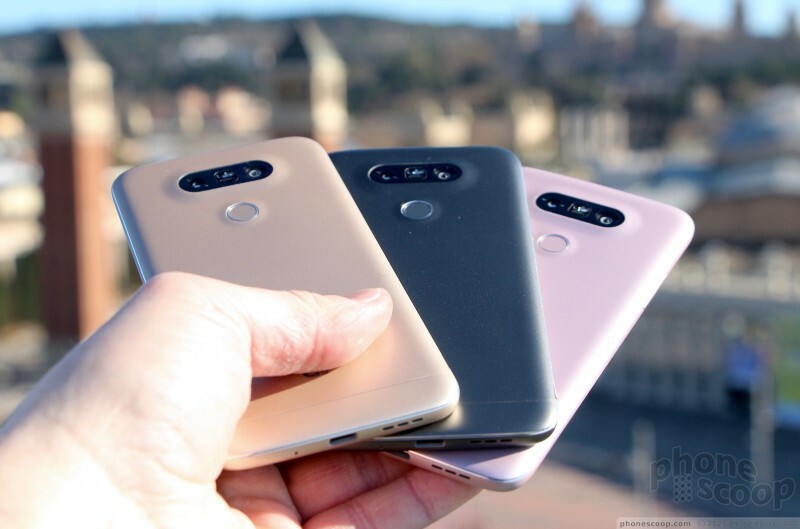 The G5 represents an excellent vision on LG's part and it should perform much better than the G3 or G4 did as long as it can keep pricing reasonable. 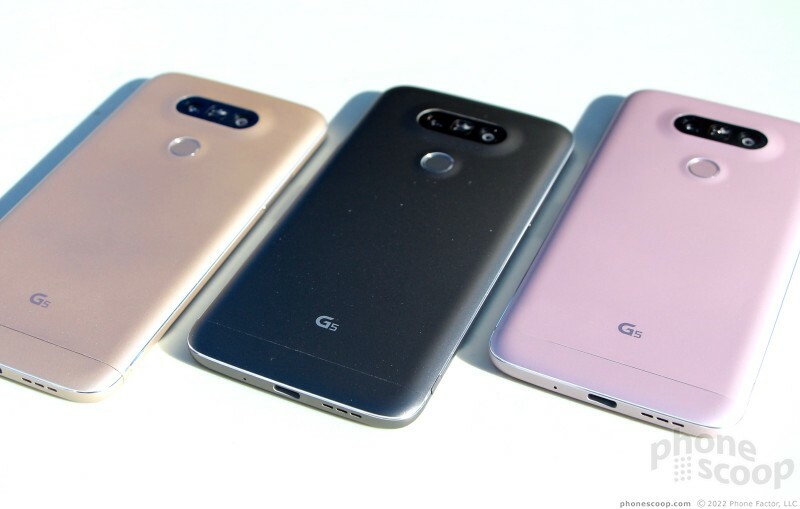 The G5 comes in four attractive, metallic colors and will be sold by all the major carriers in the U.S. We look forward to testing it out in April. LG today made the G5 Friends accessories available for purchase from its web site. Consumers can buy the CAM Plus ($70), 360 CAM ($200), 360 VR goggles ($200), and Tone Platinum headphones ($200) to go with their G5. LG has made an alternate home screen experience available to G5 owners that brings back the app drawer. 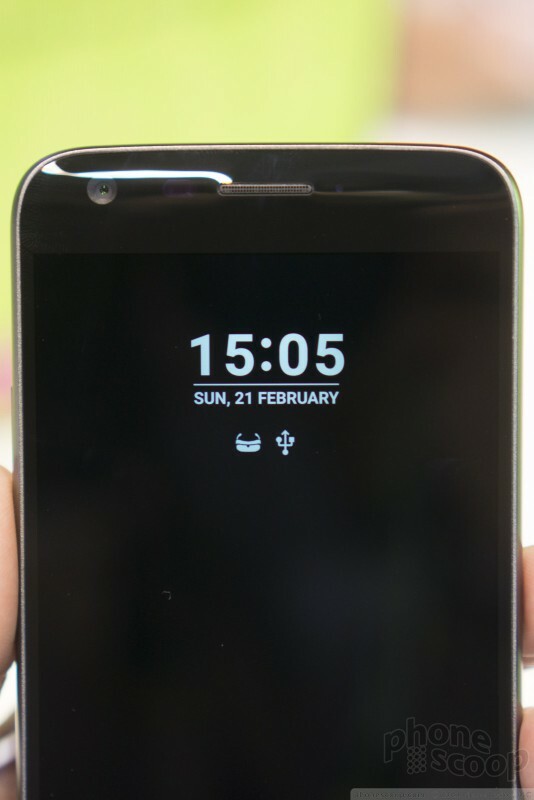 The G5 initially launched with LG's UX 5.0 home screen experience, which removed the app drawer and kept all apps on the home screen panels. 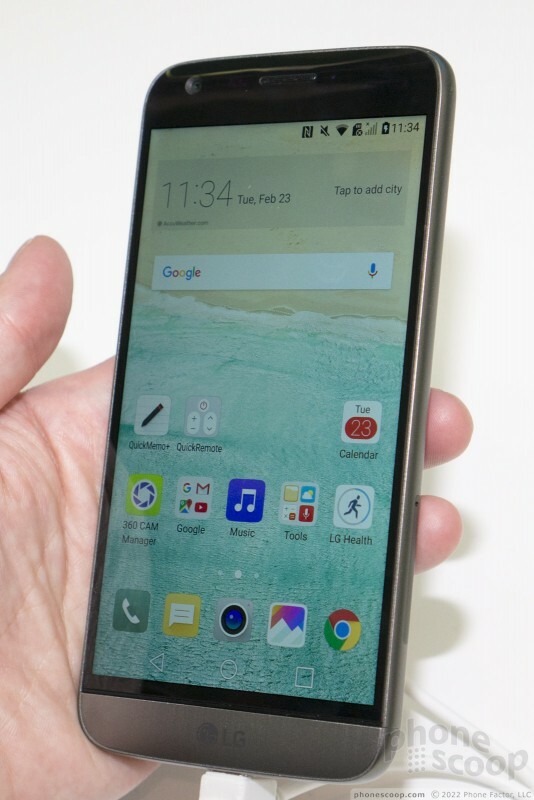 I want one of these with a 5.7" screen (or bigger), a stylus, a slide out keyboard, and multitasking on par with what we get from Samsung please. 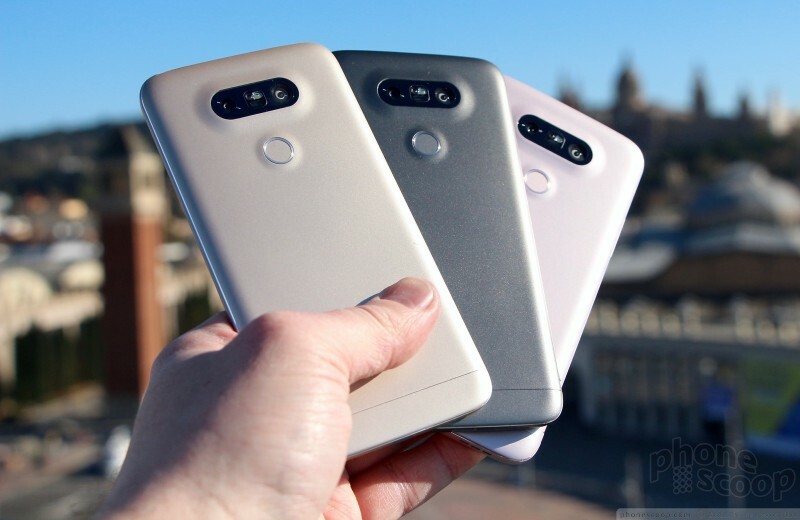 Will they continue with the circle case like the G3 and G4?